Baby pigs are born with a smaller supply of iron than most animals, yet they require a great deal of this mineral due to their rapid growth rate. Pigs born outdoors or in the wild get iron by rooting in the soil, but the only source of nutrients available to piglets born indoors is sow's milk, which contains no iron. Swine producers raise pigs in confinement buildings so it's necessary to inject piglets with supplemental iron. Iron is essential to all animals for the prevention of anemia. When an animal is iron-deficient, the animal is considered anemic. Iron is a building block for hemoglobin; anemia is a condition marked by decreased hemoglobin in the blood. Hemogloblin, found in red blood cells, are responsible for carrying oxygen from the lungs to body tissues and for returning carbon dioxide from tissues to the lungs to be exhaled. Iron is also part of many other proteins in the body. Pigs suffering from iron deficiency will exhibit pale coloring around the eyes, nose and mouth. Healthy tissues should be pink. A condition commonly called "thumps" may occur, whereby piglets experience spasmodic breathing. Pigs with iron deficiency are more susceptible to scours, or diarrhea, than pigs with healthy iron levels. Other health disorders increase in incidence for pigs with low iron, but commercial producers report no evidence of negative impact on weight gain. Baby pigs are born with a smaller store of iron than most young animals. Their supply of iron will sustain hemoglobin production for only three to four days if an outside source of iron isn't provided. 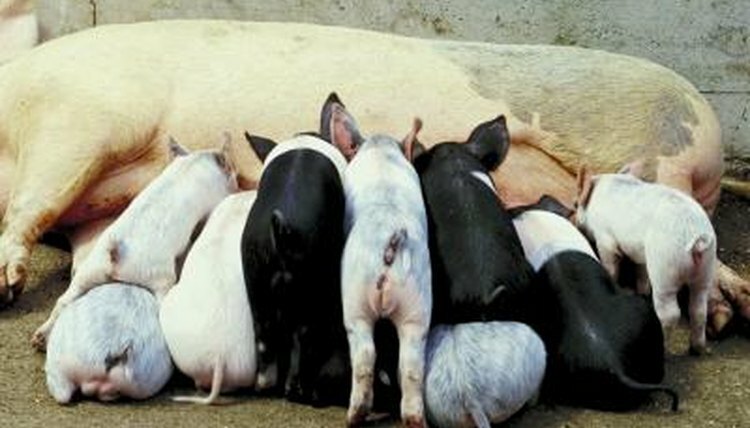 Compared with other young animals, newborn pigs grow at an exceptionally fast rate. This means the blood volume is rapidly increasing and diluting hemoglobin concentration. In the wild, baby pigs root in mineral-rich soil to get more iron in their systems, a form of natural supplementation. For pigs born indoors or outside on frozen ground, the only access to iron is through mother's milk. Sow's milk is an extremely poor source of iron, so supplementation is critical. You can administer iron to your pig orally or via injection. Most producers give injections to ensure accurate dosage and ensure that each pig gets adequate treatment. In commercial operations, handlers inject piglets at one to three days of age. It is best to give injections with a 1/2-inch 20-gauge needle, behind the ear on the muscle of the neck. A second injection prior to weaning may be necessary. It is important to follow each product's specific labeling for dosage.